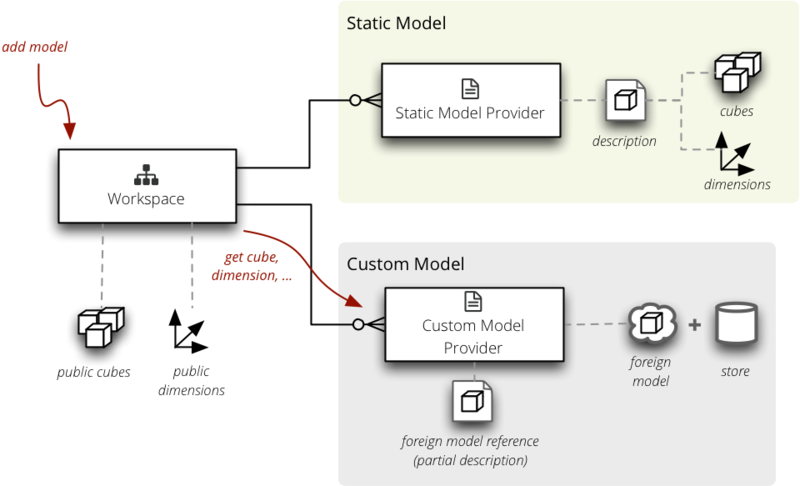 Model providers create cubes.Cube and cubes.Dimension objects from a metadata or an external description. To implement a custom model provider subclass the cubes.ModelProvider class. It is required that the __init__ method calls the super’s __init__ with the metadata argument. list_cubes() – return a list of cubes that the provider provides. Return value should be a dictionary with keys: name, label, description and info. dimension(name, dimensions) – return a cubes.Dimension object. dimensions is a dictionary of public dimensions that can be used as templates. If a template is missing the method should raise TemplateRequired(template) error. requires_store() – return True in this method if the provider requires a data store (database connection, API credentials, ...). To provide a cube implement cube(name) method. The method should raise NoSuchCubeError when a cube is not provided by the provider. It is recommended to use the linked_dimensions name list. The dimensions is considered an advanced feature. The above provider assumes that some other object providers the date dimension. Some providers might require a database connection or an API credentials that might be shared by the data store containing the actual cube data. In this case the model provider should implement method requires_store() and return True. The provider’s initialize_from_store() will be called back at some point before first cube is retrieved. The provider will have store instance variable available with cubes.Store object instance.